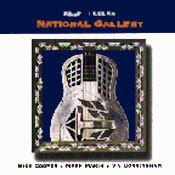 This particular National Gallery has nothing to do with pictures - unless, that is, you can use the music on this CD to conjure up images of southern USA in the '20's, 30's and 40's. These wholly authentic versions of blues classics played on the Dopyera brothers classic instrument, the National Resophonic Steel guitar (from whence the name actually derives) vividly evoke the dustbowl and hitching rides on freight trains. Mike Cooper has been playing blues since his teens, which was some considerable time ago, and is renowned for his expertise on the National guitar. His first album "Oh Really" is still regarded as a contemporary blues classic, and was re-issued by Beat Goes On records. Mark Makin, along with Bob Brozman in the USA, is the foremost authority on the range of instruments built by the Dopyera brothers in their workshop in L.A. between 1926 and the second world war. He also plays them all, extremely well as you can hear. Mike Cooper says: "The music on this album seems to cover most of the different styles of blues that I have, at one time or another, played over the years. Mark plays most of the main guitar parts, whilst I play all the slide and bottleneck parts." The album stands as a tribute to those early performers whose works are included and also as a robust reworking of some classic vintage blues.